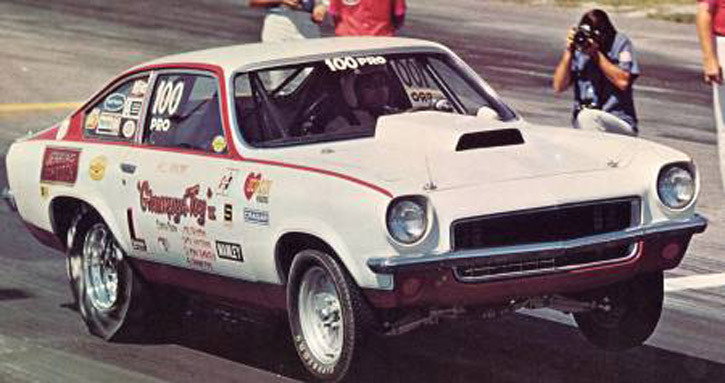 I've always loved the look of the early '70's pro stock cars. 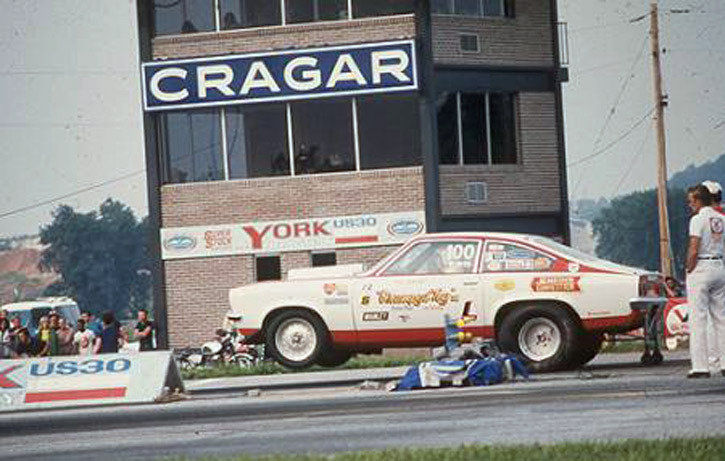 These cars pioneered the usage of a narrowed rear axle and funny car sized slicks in a stock bodied car. Later, during the 80's, these cars served as the inspiration for the pro street movement and spawned thousands of hot rod look-a-likes. 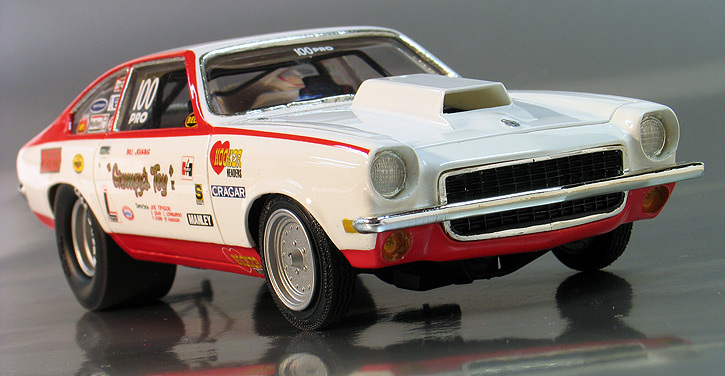 The Bill Jenkins' "Grumpy's Toy" Chevy Vega was one of the pioneering cars to feature this setup and I thought It would be fun to build a replica. Also my dad bought a Chevy Vega new in '72 so I have a soft spot for them. To build my replica I used a Resin Roundup '72 Vega resin body. It's a re-pop of the MPC "Grumpy's Toy" body so it had the proper widened rear wheel wells. It comes with only the body parts so I kit bashed it with the latest re-issue of the AMT/MPC "Twister" Vega pro street kit to provide the chassis, interior, glass and misc. parts. These resin bodies take quite a bit of cleanup work. They often have pin holes and other blemishes that have to be filled and sanded. Also the window areas are usually flashed over with a thin layer over resin and the castings are a little thicker than normal. You'll need a Dremel tool to grind away the extra material and clean out the windows and wheels openings. But, the price of the bodies are much more reasonable compared to buying an original kit. 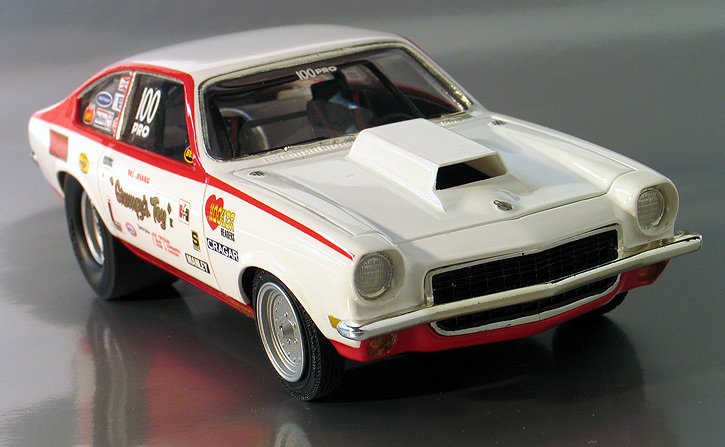 The wheels provided in the "Twister" Vega kit did not match my photo reference very well, so I sourced a better set of wheels from the old AMT '76 Nova Pro Street kit. This kit was also re-issued recently so they aren't hard to find. Since I was planning on building several different '70's pro stock cars using these wheels I decided to make a mold and cast some duplicate sets in resin. Finally, they were painted with Testor's Model Master stainless steel for a realistic look. 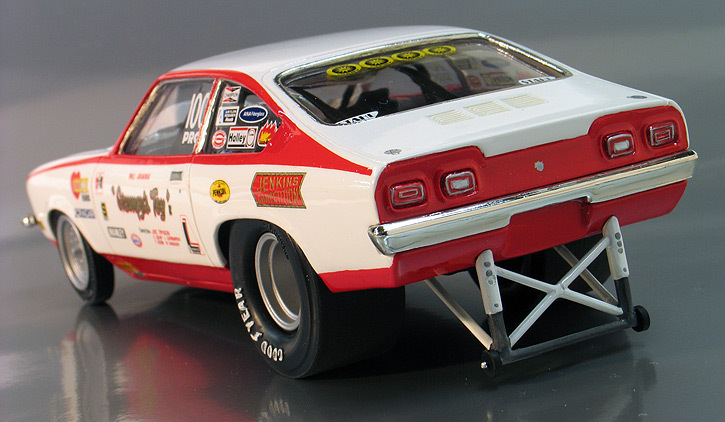 The rear tires came from the "Twister" kit while the front tires came from a Model King Cougar Funny Car kit. After prepping the resin body it was painted with Tamiya gloss white. The rocker panels were masked and sprayed with Tamiya gloss red. The decals are from Slixx. They were the typical excellent quality I've come to expect from Slixx and the sheet offers several different versions of Grumpy's Vega. After applying the decals the whole body was shot with a two part urethane clear. I also made a set of side windows from clear sheet acetate so I could apply the window decals. The resin kit comes with the bumpers unplated. First I removed the molded-in license plate on the rear bumper and then sent them to Chrome-Tech USA and had the front and rear bumpers chromed. I wanted to keep this just a simple curbside build so I glued the hood shut and it has no engine or extra chassis detailing. All-in-all, it was a fun little quick build and filled a gap in my drag racing collection. Below are some pictures of the real car.